The big driver to equipment selection is knowing what requirements the UAV is to meet. This is usually encased within what sort of mission it would usually fly. In this circumstance there are two initial factors: ground resolution and area coverage. Ground resolution refers to how large each pixel captured by the camera is on the ground. For example, 1 pixel may have a resolution of 10x10cm on the ground. 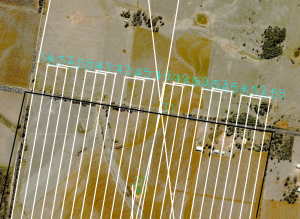 Area coverage is how much ground the UAV can cover in 1 flight. Usually the UAV will be searching a given area. Thus it would be flying a search pattern to cover that entire area. This is usually expressed in square kilometres. For example, a UAV may be able to cover 2 km2 per flight. These requirements interlink with the mission profile – altitude, speed and so forth. So there are tradeoffs to be made. There are also other considerations to take into account. This includes to small/portable the system is, what weather conditions it can be expected to operate in and what sort/size ground crew (staff) is required. 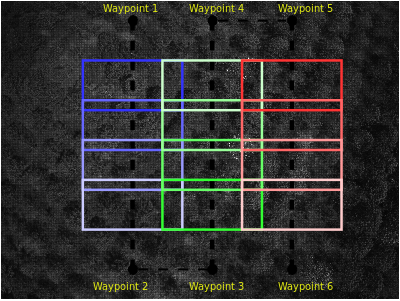 The desired ground resolution is dependent on what size objects are being looked for. In the case of a person-shaped object, a good resolution is 10x10cm per pixel. This would make the average sized person (assuming they are laying flat on the ground) around 10×20 pixels in size. Note that the ground resolution may vary in width and length. For example, in CanberraUAV’s setup, a PointGrey Chameleon (4.9×3.6mm sensor, 1296×964 pixels resolution) was used with a 2.8mm lens at a height of 100m. Thus the ground resolution would be 0.135×0.133m. Each pixel would represent 13.5cm by 13.3cm on the ground. From this, the sensor (ie. 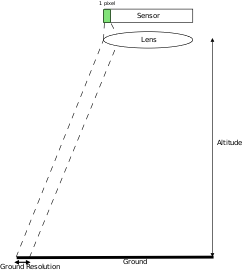 camera) type, lens type and altitude of the UAV can be varied to reach the desired resolution. The area coverage requirement gives how much area can be captured by the camera in 1 flight. From the previous section, the resolution requirement will be used as a basis here. 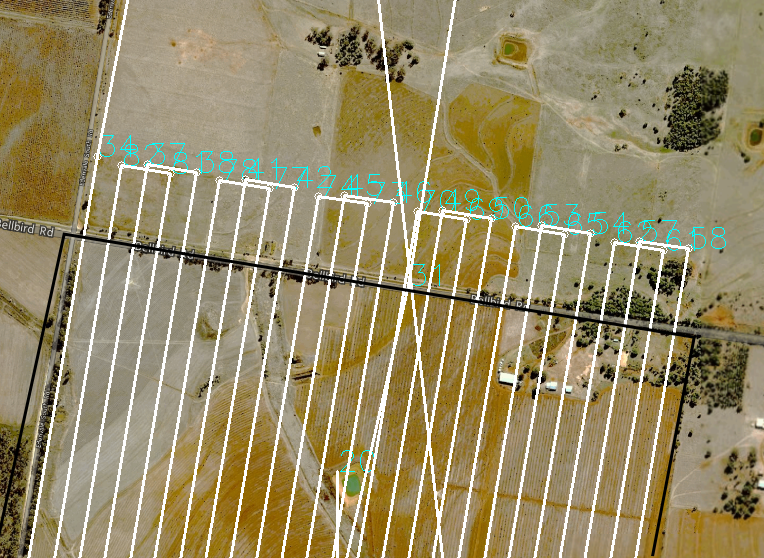 In the case of CanberraUAV’s setup, an area of 175m x 128m would be captured in each image. Assuming that the UAV is travelling in straight and level flight at 33m/s, an image would have to be captured every seconds – 3.8 seconds. Thus the camera (and any associated image processing equipment) should be capable of capturing and processing 1 image every 3.8 seconds. 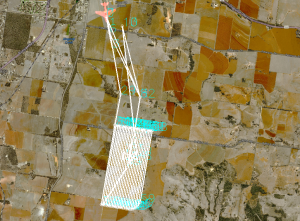 Given that the UAV has enough fuel for 90 minutes worth of flight (in CanberraUAV’s case), some portion of that fuel will be used for getting to/from the search area, as well as turns during the search pattern (as shown below) will reduce the flight time spent over the search area. Assuming 10 minutes each for getting to and from the search area and that 10% of the time in the search area will be spent turning back for another run, that gives 63 minutes of search time. It would be prudent to allow a 20% overhead, so 50 minutes search time. 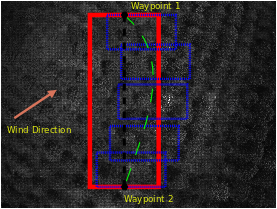 From before, the imaging system can capture a 175x128m area of ground every 3.8 seconds. So that is = 789 image captures over the search area. So, a = 17.7 km2 area can be captured in 1 flight. A major factor to consider is what weather conditions the UAV is likely to be used in. Since most UAV’s are small, they can be heavily affected by the wind and may find it difficult to stay on course. This may result in the UAV missing part of the search area or using an increased amount of fuel to get closer to being on course. The exact effects of the wind will vary depending on airframe size, speed and the abilities of the flight controller software. In CanberraUAV’s case of using a 10kg UAV with the APM:Plane software, any wind beyond 15-20kts would make it very difficult to stay on track. Below is an example of wind effects. The desired UAV course and imaging area are shown in black and red respectively. Due to the wind, the actual course (green) and actual images captured (blue) are different. If 100% coverage of the search area is desired, it is worth overlapping the search pattern (in both directions) to ensure any parts of the area not captured by one pass, will be captured by the next pass. 30-50% overlap is generally required for near-100% coverage. This, of course, means that the search area coverage (in the previous section) will be decreased by that percentage. So a 50% search area overlap will bring a 17.7km2 area coverage down to 8.9 km2. An example of overlapping images in both the direction of flight and across the search pattern is shown below. Times of low light or visibility may degrade the camera’s ability to capture sharp images. This will vary depending on the exact camera model used, so some testing may be required. If the UAV system is going to be used in remote areas, some consideration must be given to portability. In particular, the launch and recovery of the UAV should be given some thought. For a conventional “runway” takeoff and landing, the UAV will require a straight and flat surface (generally a road) around 150m in length (depending on the size of the UAV). UAV’s, due to their small size, are greatly affected by any bumps or potholes on the runway surface. So care must be taken to use a smooth runway. If the UAV is to be used on more remote areas, other launching methods such as catapults or hand launching should be considered. These methods tend not to be practical for UAV’s with a weight of more than 5kg. In terms of landing a parachute or capture in a net/arrestor hook are common. Generally speaking, it is easier to keep the UAV to less than 5kg weight if it is to be used in areas away from roads/runways. The second part of portability is getting the UAV and it’s support equipment to the launching area. 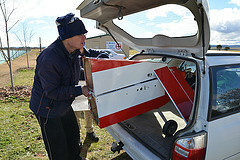 All support equipment (and the UAV) should be able to fit in 2-3 vehicles capable of travelling to the launching point. This of course limits the size of the UAV and any support equipment. At a minimum, a pilot and ground station controller will be required. The pilot to handle the takeoff/landing (with manual takeover is required) and the ground station controller to monitor and issue commands to the UAV during the mission. It is also useful to have one or two people helping the pilot with the setup/packup of the UAV and acting as spotters. Each team member should have clearly defined roles and responsibilities both in the setup and flight phases of the mission. An example of this is here. In terms of the imagery, choosing where to process the imagery data will drive a number of design decisions. Having the imagery processed onboard the UAV will require a computer powerful enough to do this in realtime. Small ARM-based boards (like the Odroid) are increasingly useful for this task. It does limit the amount of processing that can be done to the images, due to the small CPU’s on these boards. This is dependent on how fast the images are being captured by the camera. In previous sections, the example of 1 image per 3.8 seconds was used. So any image-processing algorithms must be able to capture, store and analyse at least 1 image in that time. Off-board processing, my comparison, allows the imagery to be processed either at the ground station or another site (in the cloud) with powerful computers. This necessitates a reliable high-datarate radio link to the ground station or the Internet. A 3G/4G mobile phone network is workable, but does limit the UAV to flying in areas with network coverage. Care will also have to be taken to choose a 3G/4G modem that is reliable (or fly with multiple modems) to reduce the chance of datalink loss. 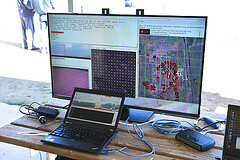 In CanberraUAV’s case, an Odroid on-board computer is used with the custom cuav image processing software. Although all the processing is done on the UAV, it is able to send the occasional (far less than realtime) image to the ground station via the radio links. In addition, all images were saved on a memory card attached to the Odroid. This allowed a post-flight analysis of the images and tuning/debugging of the image analysis algorithms.